Carlsbad, CA (November 18, 2015) – SynergEyes, Inc., the worldwide leader in hybrid contact lens technology, has gleaned insight into the true toric-patient experience through two recent studies: a national study of 400 toric wearers, and a clinical study of the four leading toric brands. The clear, consistent insights reveal the challenges astigmatic patients experience with toric lenses, and their ongoing quest to find more satisfactory vision correction options. Eighty-two percent of toric wearers reveal that they frequently experience issues with their toric lenses. Of those, almost 40% experience issues 3+ times per day. The issues include blurry and hazy vision, fluctuating, unstable and shifting vision, rotating lenses and discomfort. 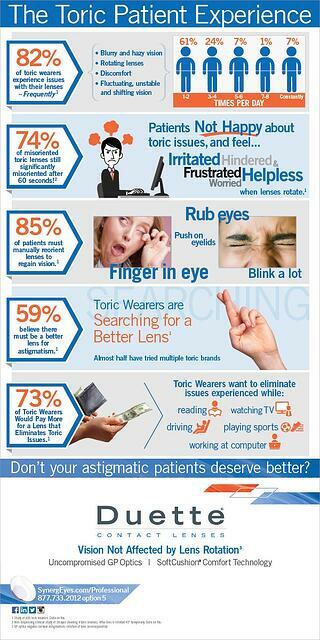 Patients feel irritated and frustrated with their toric lens issues. SynergEyes has developed an infographic illustrating key insights from the studies. The Toric Patient Experience Infographic can be downloaded here. The clinical and patient studies were conducted by SynergEyes as part of an ongoing effort to gain a deeper understanding of patient vision challenges and vision correction needs. SynergEyes products include Duette®, the high-performance hybrid contact lens for astigmatic and presbyopic patients. With uncompromised GP optics and SoftCushion® Comfort Technology, Duette provides clear and stable vision not affected by lens rotation.3 The contact lens features an 84 Dk silicone hydrogel skirt around the 130 Dk center. Duette lenses can be designed empirically based on a refraction, and corneal curvature measurements (no fitting sets or fluorescein are required for the Duette fit). 1 Study of 400 toric wearers. Data on file. 2 Non-dispensing clinical study of 38 eyes (leading 4 toric brands). Data on file. 3 GP optics negates corneal astigmatism; rotation of lens inconsequential.